Regular readers of this blog may recall that I have a certain quirky prediliction for shark movies) I say quirky because they a) give me the heebe jeebies and b) have given me nightmares about sharks winking at me – but let’s not discuss that). Awhile back I had the misfortune to watch the movie “Megalodon”. I say misfortune because quite frankly it sucked! It did, however, get me thinking about shark evolution. In the movie Megalodon is portrayed as a giant great white shark, so I was curious about what the evolutionary relationship between the two. Megalodon was a giant shark (believed to be 40-50 feet long) that lived from 25 to 1.6 mya. It is believed that megalodon evolved in conjuction with whales. 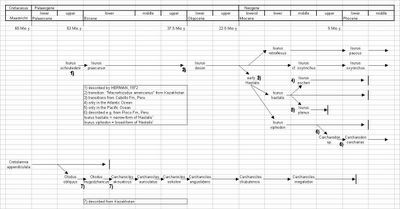 The evolutionary lineage leading to megalodon can be traced fairly well (see chart below). Below is a megalodon tooth. Great white sharks, on the other hand, can be traced back 5 million years to the pliocene. This is where the controversy begins. Until recently, Megalodon was placed in the sam genus (Carcharodon) as the great white and reconstructions of megalodon portrayed it as looking almost exactly like a great white. In recent years this view has been challanged. Scientists and amateurs alike have challenged the view. 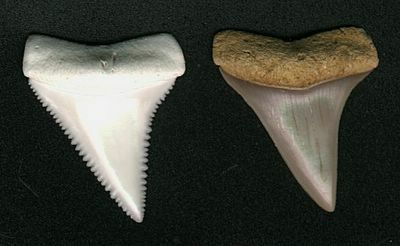 Above is a comparison of the teeth of Megalodon (right) and a great white (left). On the surface they both look pretty similar. It should be pointed out at this point that the Megalodon tooth is from a small juvenile and the great white tooth is from an adult. Look a little closr and you will start to notice differences. One of the more pronounced differences is in the area of the collum – the transitional are between crown and root. In megalodon this area is large and broad. In the great whites it almost doesn’t exist. Another difference is in the shape of the roots. 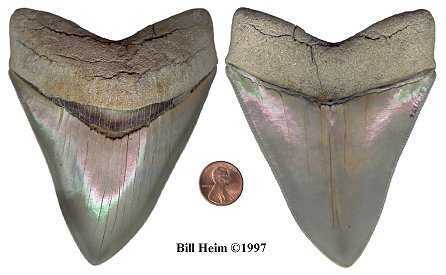 The roots in Megalodon form a “V” shape, whereas in the great white the roots are horizontal. What can’t be seen in the picture is that Megalodons teeth are almost 3 times as broad as great white teeth. About the only thing the teeth share in common is the serration. 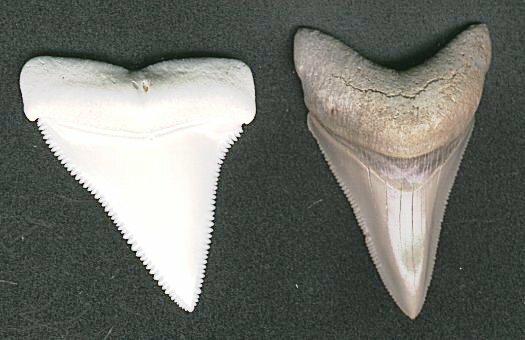 Above is a comparison of a great white tooth with Isurus hastalis (an ancestor of the makos). Note that, like the great white, Isurus hastalis does not have much of a collum and has flat roots. About the only difference is the lack of serration in Isurus hastalis. This has lead to the theory (see links above) that makos and great whites are related and that great whites evolved from mako ancestor. Interestingly enough, a series of finds in Peru, in layers ranging from the late Miocene to early Pliocene, has buttressed this argument. In the late Miocene layers one finds Isurus hastalis in the early Pliocene layers one finds Carcharodon carcharias (the great white). In between one finds several transitional species and in point of fact identifying how many is difficult. Finally, studies in molecular biology indicate great whites and makos are related. Below is a phylogeny based on the great white/mako relationship. See here and here for additional info. Those teeth are quite large. Since I have no plans to get near a shark, it’s nice to be able to get an idea of how big they really are.